The Cultural Foundation of Banca del Gottardo presents a new multimedia project by Silvio Wolf created specifically for Galleria Gottardo. Paradiso is composed of two distinct and complementary parts: The Truth, or the set of photographic works, and The Treasure, the video work for which a room has been set aside in the exhibition. 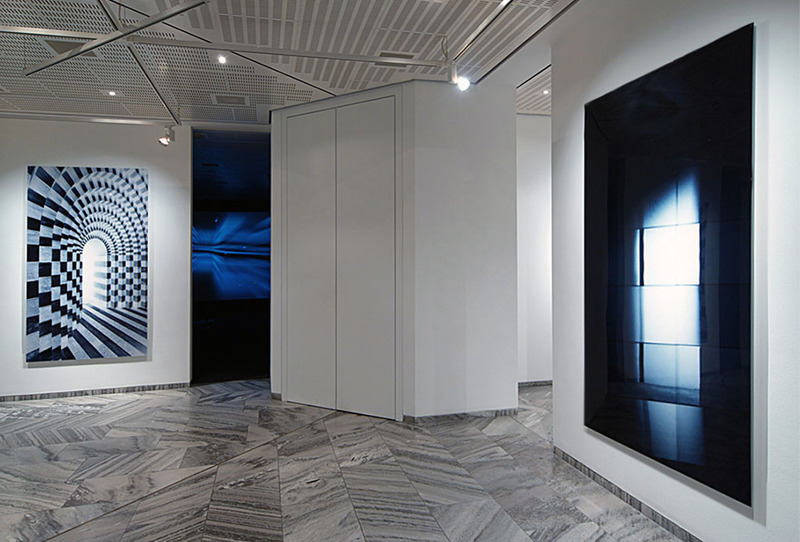 The artist has concentrated on the architecture of the Galleria Gottardo exhibition space and of the Bank that contains it, interpreting it through the use of photography and video to create a special relationship between the place and the work. Paradiso is the result of exploration of the spaces designed by Mario Botta, and of the intuition of an idea of architecture seen as the art of making emptiness inhabitable. This concept is connected to the poetics of the artist on the themes of absence, emptiness and elsewhere, which recur in all his photographs and multimedia installations. 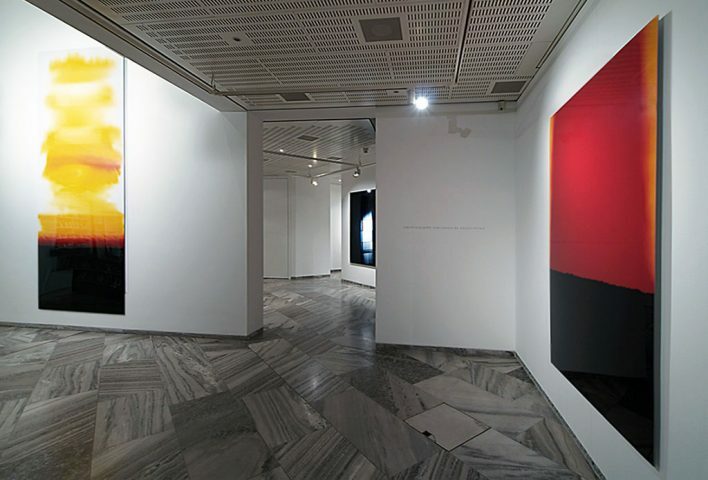 The large photographic works on the walls and the video projection form the itinerary of a real and symbolic voyage taken by the visitor through the show: the work Paradiso is conceived as a place of experience whose static and dynamic, visible and concealed parts are interconnected in a single network of visual cross-reference. The artist looks for a guide, an underlying law, in the architecture: in his voyage through signs, canons and codes of space he explores the threshold between present and elsewhere, between material reality and immaterial entities. Along the way he creates images that are metaphors of the place, based on resemblance as well as disappearance and transcendence. The work Paradiso is composed of timeless images of eternal places. The four rooms of the gallery are conceived as the places crossed in a voyage: the Tree of Paradise is the Map of the Treasure. The first room represents the origin, where the visitor is faced with three abstract photographic works, apparently lacking definable visual references: Totem, the largest work in the show and the cornerstone of the entire project. Yellow and Red, sculptures of light and color, positioned symmetrically with respect to the entrance, macroscopic enlargements of the initial strips of the rolls of film used by the artist. Fragments randomly exposed to light and irregularly developed by the chemical process. Their surprising visual power comes from the unpredictable capacity of the film to independently generate a true photograph, doing without the iconic will of the photographer: these are pure images of language, inscriptions of light and color. This cycle of works, which the artist calls “photography before the picture” and also “light echoes”, does not generate representations, in the traditional sense of the term, but radical forms of becoming and possibility: allusions to the structuring and dissolving of real space that await the visitor in the following rooms. 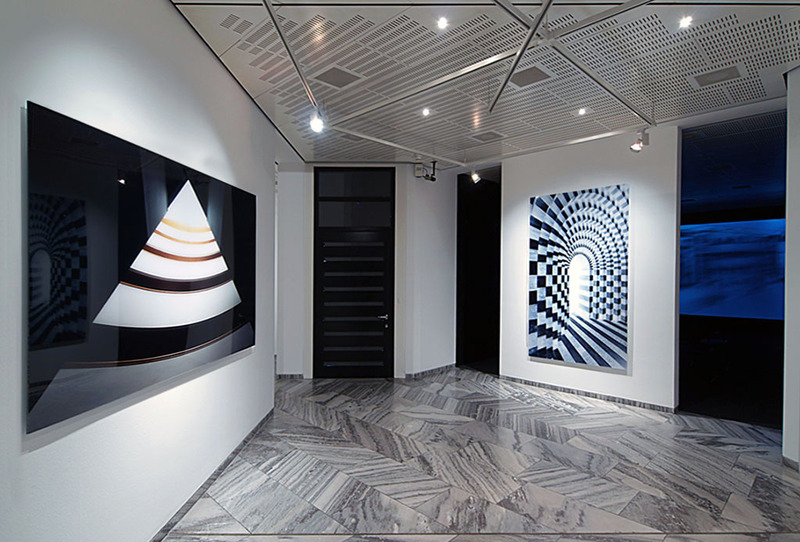 The middle room contains three photographic works, positioned at the center of each of the three walls. At their sides the pairs of doors that divide and join the other three rooms of the gallery open symmetrically. Each of these large images represents a place of passage: Pyramid, the luminous ascending perspective figure generated by the balconies and the skylight of the adjacent Bank building; Treasure, the reflected image of the entrance to the great Caveau, 18 meters below the feet of the visitors; Apse, a perspective detail of the Church of San Giovanni Battista at Mogno, also designed by Mario Botta, interpreted by Wolf as a concave and convex structure inspired by the idea of Islamic architecture. This is the inner heart, the spark and root of the entire project. The projection room, with a suspended screen, for the video work The Treasure is the place of a magical subjective voyage through the works of the exhibition and the bowels of the site. The visitor identifies with the experience of the subject, whose floating eye descends and enters the mysterious space below, entirely clad in reflecting and opaque metal surfaces, which the artist interprets as the binary codes, the inscriptions of this deep place. The exploration of the impenetrable space, impermeable to the gaze, created to give invisible form to what it contains, happens along three successive, gradual paths. As in a process of exegesis that gradually increases the density of interpretation of Reality, the wandering gaze of the subject penetrates the place, and as the cold surfaces slowly dissolve they reveal their secret, which is not material in nature. The evident and the hidden both appear, the near and the infinitely far: echoes of light, stellar spaces, a universe the subject crosses as if traveling in a spaceship: a mysterious listening station. The fluid sequence shot finally leads the subject back to a complete perception of the place; through an ascending movement, symmetrical to the initial descent, the voyage comes to an end but also begins again, a fantastic loop in space and time. The fourth room in the exhibition, conceived with a symmetrical scheme, as the place of the double, contains the cycle of works Elsewhere on the longitudinal walls: negative, blurred visions of the steel surfaces of the Treasure, almost a zero degree of vision that alludes to a not-only-retinal interpretation of reality. With a dominant cold, desaturated blue tone, this series of works represents the evidence of a deep, invisible space whose codes and mysterious presence are re-inscribed by Photography. 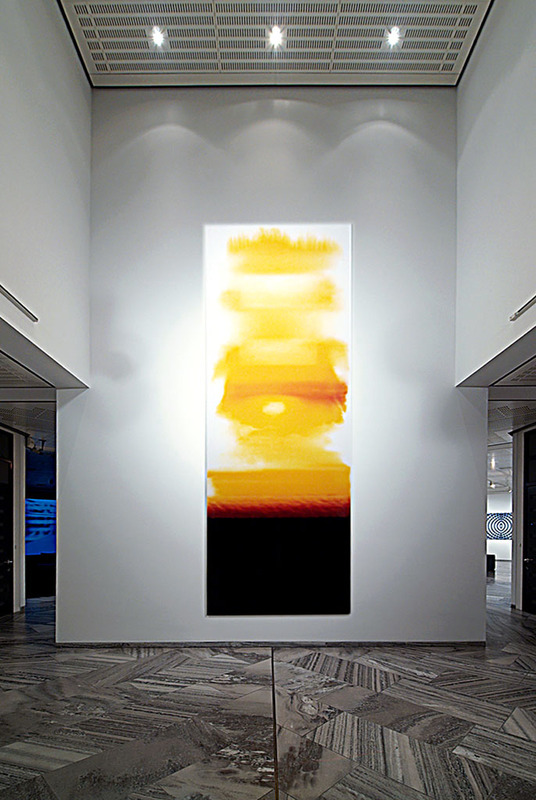 Two large double works, Sefer and Shell, conclude the exhibition itinerary. The first, which alludes to the forms of a book, offers itself as the surface for possible writing and viewing; the second leads toward a metaphorical dimension of architecture that accompanies the traveler-visitor inside and afar, encouraging him to search further, through the image, for the Truth of the time and the place. For the exhibition a public presentation will also be held of the book Paradiso, Photography and video by Silvio Wolf, with texts by Francesca Pasini, Lyle Rexer and Silvio Wolf, published by Contrasto and Galleria Gottardo, graphic design by Studio Theredbox Communication Design. The book, which is part of the entire project, is like a Tree of Paradise and Treasure Map to accompany the reader in the voyage through the work of the artist and includes a DVD with backstage and interview to Silvio Wolf. Paradiso si compone di due parti complementari e distinte: La Verità, l’insieme dei lavori fotografici, e Il Tesoro, l’opera video alla cui proiezione é dedicata un’intera sala della mostra. L’artista ha concentrato la sua ricerca sull’architettura dello spazio espositivo Galleria Gottardo e dell’edificio della Banca che lo ospita, interpretandoli attraverso l’uso della fotografia e del video, creando una relazione speciale tra luogo e opera. Paradiso nasce dall’esplorazione degli spazi progettati da Mario Botta e dall’intuizione di un’idea d’architettura pensata come arte di rendere abitabile il vuoto. Questo concetto si collega alla poetica dell’artista attorno ai temi dell’assenza, del vuoto e dell’altrove che attraversano tutta la sua produzione fotografica e d’installazione multimedia. l’opera Paradiso è concepita come un luogo d’esperienza le cui parti, statiche e dinamiche, visibili e celate, sono collegate tra loro in un’unica rete di referenze e di rimandi visivi. L’artista ricerca nell’architettura una guida ed una legge sottesa: nel suo viaggio attraverso segni, canoni e codici dello spazio, esplora la soglia tra il presente e l’altrove, tra realtà materiale ed entità immateriali. Su questa strada crea immagini che sono metafore del luogo, fondate sia sulla verosimiglianza, sia sull’idea di scomparsa e di trascendimento. L’opera Paradiso é costituita da immagini senza tempo di luoghi eterni. Le quattro sale della Galleria sono pensate come stazioni d’un viaggio: l’Albero del Paradiso è la Pianta del Tesoro. La prima sala rappresenta l’origine, nella quale il visitatore si confronta con tre opere fotografiche astratte apparentemente prive di definibili referenze visive: Totem, la più grande opera in mostra e pietra angolare dell’intero progetto. Yellow e Red, sculture di luce e colore collocate simmetricamente rispetto all’ingresso, macroscopici ingrandimenti degli spezzoni iniziali di pellicole fotografiche utilizzate dall’artista. Frammenti casualmente impressionati dalla luce ed irregolarmente sviluppati dal processo chimico. La loro sorprendente potenza visiva deriva dall’imprevedibile capacità della pellicola di generare in piena autonomia una vera fotografia, facendo a meno della volontà iconica del fotografo: sono pure immagini del linguaggio, scritture di luce e colore. Questo ciclo di lavori, che l’artista definisce “photography before the picture” ed anche “light echos”, non genera rappresentazioni in senso tradizionale, ma radicali forme del divenire e del possibile: sono allusioni alla strutturazione e al dissolvimento dello spazio reale che attende il visitatore nelle sale seguenti. Ai loro lati si aprono simmetricamente le coppie di porte che dividono e uniscono le altre tre sale della Galleria. Queste grandi immagini rappresentano altrettanti luoghi di passaggio: Piramide, la luminosa figura prospettica ascendente disegnata dalle balconate e dal lucernario dell’adiacente edificio della Banca; Tesoro, l’immagine riflessa dell’ingresso del grande Caveau, 18 metri sotto i piedi dei visitatori; Abside, un particolare prospettico della Chiesa di S.Giovanni Battista a Mogno, sempre progettata da Mario Botta ed interpretata da Wolf come una struttura concava e convessa, ispirata all’idea di architettura Islamica. È il cuore profondo, scintilla e radice dell’intero progetto. La sala di proiezione, su schermo sospeso, dell’opera video Il Tesoro, è il luogo d’un magico viaggio in soggettiva attraverso le opere della mostra e le viscere del luogo. Il visitatore s’identifica con l’esperienza del soggetto il cui occhio flottante discende e s’addentra nel misterioso spazio sottostante, interamente rivestito da superfici metalliche riflettenti ed opache, che l’artista interpreta come codici binari e scritture di questo luogo profondo. L’esplorazione dello spazio inviolabile, impermeabile allo sguardo, creato per dare forma invisibile a ciò che contiene, avviene attraverso tre successivi e graduali percorsi. Come attraverso un processo di tipo esegetico che sempre più addensa la lettura della Realtà, lo sguardo errante del soggetto vi penetra e mentre le algide superfici lentamente dissolvono, rivelano il loro segreto, che non è materiale. Appaiono il palese e l’occulto, il vicino e l’infinitamente lontano: echi di luce, spazi stellari, un universo che il soggetto attraversa come trovandosi in una nave spaziale: misteriosa stazione d’ascolto. Il fluido piano-sequenza riconduce infine il soggetto ad una percezione compiuta del luogo; attraverso un percorso ascensionale simmetrico a quello iniziale, il viaggio termina e assieme riprende, in un fantastico loop nello spazio e nel tempo. La quarta sala della mostra, pensata secondo uno schema simmetrico e come luogo del doppio, presenta sulle pareti longitudinali il ciclo di opere Altrove: visioni negative e sfocate delle superfici d’acciaio del Tesoro, quasi un grado zero della visione che allude ad una lettura non più solo retinica della realtà. Dominata da un colore blu freddo desaturato, questa serie di lavori rappresenta l’evidenza d’uno spazio profondo e invisibile, di cui la fotografia riscrive i codici e la misteriosa presenza. 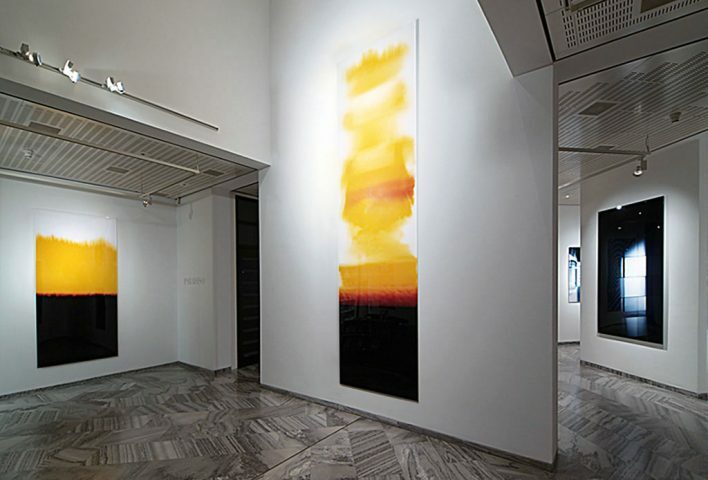 Due grandi opere doppie, Sefer e Shell, chiudono il percorso dell’installazione. La prima, che allude alle forme di un libro, si offre come supporto di una scrittura e visione possibile, la seconda conduce verso una dimensione metamorfica dell’architettura, che accompagna il viaggiatore-visitatore dentro e lontano, invitandolo a ricercare più in là, attraverso l’immagine, la Verità del tempo e del luogo. In occasione della mostra sarà presentato al pubblico il libro: Paradiso, Photography and video by Silvio Wolf, con testi di Francesca Pasini, Lyle Rexer e Silvio Wolf, pubblicato in coedizione da Contrasto e Galleria Gottardo, progetto grafico dello Studio Theredbox Communication Design. Il libro, che è parte dell’intero progetto, si presenta come Albero del Paradiso e Pianta del Tesoro, per accompagnare il lettore nel viaggio attraverso l’opera dell’artista ed è arricchito da un DVD con backstage e intervista a Silvio Wolf.